Good Morning! This week I want to share gift ideas with you! 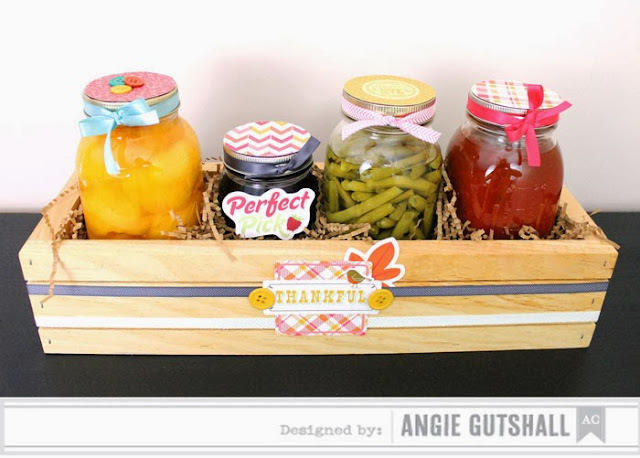 Today I want to share a fun Neighbor gift I created with the American Crafts line Autumn Crisp. You can also see this posted on the AC blog last week. For this gift I used a wooden crate and filled it with paper filler then added my jars. I decorated the tops of the jars and also the front of the crate. We can in the summer and love to share what God has blessed us with. Here you see peaches, raspberry jelly, green beans, and spaghetti sauce. Thanks for stopping by and make sure to stop by tomorrow for another gift idea.